It is 5° Celcius when we wake and this little bunny is really feeling the cold while preparing breakfast outside. We want to leave as early as possible today as the ride and camping opportunities are still a little uncertain. However, that plan goes out the window when Ali discovers the insert clips from his Ortlieb bags are missing. We comb the area to no avail, so he ends up putting the reserve set in. Of course they are at the bottom of an already packed and loaded bag. We eventually take off at 9.10am and head in the direction of Nice. Tonight, he intends to superglue these back in, but for an even better solution to the Ortlieb bag insert problem: see our cycle touring tips pages. You will have to scroll down the page a bit. It is a climb from the first pedal and it is peak hour. This time of day is the same the world over: impatient and not very observant people on their individual daily mission, which of course they consider more important than anyone else's. It is especially more important than taking time out to reduce speed for a couple of slow moving cyclists arduously pushing their way up a hill. Luckily enough, that time of day doesn't last for long and we are soon on relatively quiet roads near the outskirts of Cannes. We roll down towards the coast and stop on the esplanade just before the Nice Cote d'Azur Airport. Eating lunch in the sunshine, is the perfect way to people-watch the beach parade. We find a couple of disrupted cycle paths to follow, including one that runs from the airport all the way into the heart of Nice. Despite the pebbles, the beach is quite attractive. It slowly disappears from view as we wind the very steep incline out of the city. Apart from the swanky cruisers in the marina, the centre itself is a little dingier and older than I had expected for such a renowned area. The chic and grandeur of buildings however, picks up as we move along the coast towards Monaco. Not really sure what I had expected from Monaco either, but I'm not blown away. Sadly enough there are no rich and famous on view, though the marina is jam-packed with boats the size of basketball courts. There is an overwhelming abundance of British flags mast to them too. We stop for another bite to eat and take in the opulent scene before jumping back on the bikes and following the Formula One Tunnel. We are just a tad slower than Alonso. The route takes us back into France for just a wee bit and then we enter our third country of the day: Italy. At first, I am shocked by all the rubbish lying around but that's often the case at border crossings and it does get cleaner as we make our way towards Ventimiglia. The area is mostly agricultural and the hillsides completely tiered with greenhouses. It is all rather hap-hazard. A bit like the rush hour traffic with an overwhelming abundance of dare-devil scooter and motorcycle riders. We find the Tourist Information, but are disappointed to discover that the campground is closed for the season and our nearest chance is 13 kilometres further on in San Remo - Italy (98km; 832m). Daylight is already beginning to fade at this stage and we eventually find the campground in darkness at roughly 6pm. We are allotted a brick-laid pitch, which is the first time we have received one of these to camp on. We wonder how the tent pins will fit in, but a few manage to be hammered in between the stones. We sleep surprisingly well on such a hard surface. It was as though someone had stuck a big, round, red glow-sticker on the horizon this morning. When you stood in the sun's light, you could immediately feel its warmth and it panned out to be great cycling weather for the hilly coastal ride that lay ahead. The road along the Riviera di Ponente is not too steep and each incline usually results in a just as invigorating fall. It is Saturday and there are a number of cyclists on the road with us. We get the thumbs up and are greeted enthusiastically by most of them. Being unable to make the switch from Spanish, Ali has decided to introduce "Hola" into the Italian language. All through France he used it too, while I kept on saying "Gracias" instead of "Merci". Very confusing this all this country hopping. We go up and down for virtually the first half of the day; looking out over a serene aqua Mediterranean to the right and gazing high up at jagged rock faces to the left. At an internet cafe in Imperia we update the site and check the emails. Later that day we pass pastures of vegetables, herbs and flowers. I have never seen so many cyclamens in all my life. We take the turn off from the main road, pass a strongly scented fennel field before arriving at the only camp site open in Campochiesa (64km; 500m). Overcast skies threaten rain from the moment we set off. Less threatening are roads full of cyclists. In fact, hoards of them whiz past, greeting us as they do with their funny hand signals; some of which we haven't quite worked out yet. While they have great admiration for what we are doing, they have very little respect for traffic lights, motorists or anything else in their way. As they cycle along, four or five wide and like they own the road, I can understand why a motorist might get a bit upset with them. The expected rain comes just before Voltri and we are still 10 km or so before Pegli (78km; 473m); our planned destination. Wet and cold, we follow the campsite signs up a narrow winding road; all the while, hoping to goodness that it is open. We greet a closed gate at the top, but luckily there is a buzzer. Neither of us feel like venturing back down for supplies and besides it begins to rain more heavily. It appears that the black cloud that followed us through Portugal and Spain has found us again and that evening, we almost have a repeat performance of our Vila Real experience: with a river running through the front of our tent. Though not as intense, Ali still needs to tap drainage holes outside in the pouring rain, while I get the more pleasant job of mop up inside the vestibule. Naturally after such a downpour, everything is wet and damp this morning and we set off early, without breakfast, to combat the likes of Genova city. It seems to take forever to work our way around the port and city, but it is not a particularly difficult ride. Traffic may be very congested but we manage to maneuver ourselves through it, using bus lanes when we can. The really good signposting helps a lot. Although the kilometres aren't always accurate, it is hard to loose your way in Italy. There are plenty of signs pointing you in the right direction. We stop for a well-earned breakfast at about 11am and then get back to peddling up some really energy-zapping hills. This section of coastline will give any cyclist jelly-legs. The hills just seem to go on forever. Still, we plod along, basking in the delicious sun as we go. In this weather and especially after last night's downpour, we consider ourselves lucky. Our fortune changes further on down the road, when we think we only have 15 kilometres of tunnels along a flattish stretch of road left for the day's journey. Signs however, tell us we may not enter. The tunnels are one way traffic and controlled by traffic lights. Our only alternative is to climb another 550 altitude metres. It is 3 pm and it is pitch black by 5.30 pm. If I thought the riding earlier on in the day was difficult, that is because I haven't yet experienced what is coming next. It takes every last bit of energy out of me since the climbing is relentless. Following this, we are faced with 500 metres drop in altitude. Three hours after facing our alternative, we arrive at the campsite in Deiva Marina (93km; 1406m). We are both very cold, very exhausted, but very relieved that the downhill ride in the dark has finally come to an end. Fortunately a full moon blessed us for much of the ride down and we in turn, blessed the road workers that had painted a shiny white line down the side of the road, which was plainly visible when nothing else was. The campground has little in the way of supplies, though we mange to squeeze a soup-like pasta out of what is left in our bags and we prepare chocolate rice with flaked almonds and stewed apple with coconut and sultanas for the following day's breakfast. Something substantial will be needed to get us back up the way we came in. It takes us 1½ hours to make the 500 alti-metre climb - 5% average and 12% maximum - and unbeknown to us last night in the dark, the views are really something to see. Green grasses rise out of moss covered stone walls; forest ferns protrude through the browning discarded poplar trees; golden leaves add a splash of colour to the otherwise mist-filled air. Going down again is as steep and winding as going up is. This is one of those moments when you simply forget all that has gone wrong and just enjoy nature's gift that is in out there in front of you. We stop in Borghetto di Vara, find the bakery and sit in the square opposite another person eating his lunch. Within a few minutes we are quite bizarrely speaking Dutch with him. We quickly learn he is a buddhist monk who, even more extraordinarily, has been walking his way, penniless, around this planet for the last 8 years. He explains that the food he is eating is all free from the local shops in the village, but it is too much for him to carry in his pack. He offers us what seems like a loaf of bread and we accept the gift gratefully. Later on down the road, we discover that there's also a half wheel of cheese inside as well. Spontaneous gestures like this are sure to remain in our memories for a long time. It rains on us again but not for long. We ascend and descend with steep gradients in both directions the whole day. When we finally hit the coast, it becomes flat and turns into tourist-land. We arrive in Marina di Massa (79km;916m) and the campsite that's supposed to be open, isn't. There is another where we swiftly put up the tent so we have time to venture out and find a supermarket. It takes more effort than it should and we only find a mini-market with hiked prices. It means we can add shopping for supplies to the next day's list of chores. The campground leaves a lot to be desired and we decide that after Lucca, we are not busting ourselves to get to these poorly maintained, overly expensive plots of gravel anymore. We will have to take on a bit more wild camping. Again it is an overcast sort of day, but the rain holds off until just 20 kilometres out of Lucca. It rains enough for us to shelter under some trees for a short while but subsides giving us the chance to continue on up the 5 hairpin bends on the hill near Quiesa. We get almost to Lucca and shop at a Coop store, where I exit to see pouring rain once again. It finally calms down a bit, but only for ten minutes or so and we find soon ourselves sheltering under the city port entrance. 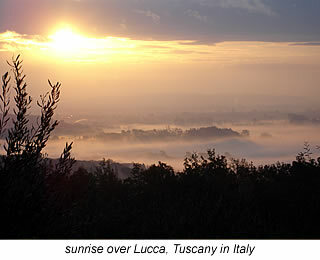 Leaving in the drizzle, we climb the 1½ kilometres to our destination 5 km outside Lucca (59km; 341m). La Fabbrica di San Martino is the home of Giovanna and Guiseppi. We are lucky enough to have been given a two night stay in this wonderful place as a going away gift from Frank and Maggie. Not only is it a treat to stay here, but we also get to dine on superb wine and delicious, traditionally cooked food with the family on the first night. The homely atmosphere is also extended to our little abode, which was formerly a farmer's cottage. As I type, I am being warmed by the stove fire in the kitchen. The sweet smoky scent of burning rosemary bush fills the air. Inside, it is so very comfortable. Outside, it is grey, miserable and not much fun at all and a complete turn about from the early morning blue skies and sunshine. Tomorrow, we will regrettably have to pull ourselves away from this luxury and get back to basics again. We leave Lucca only to stop at the end of the driveway to fix a broken spoke on Ali's bike. It is a late start, but the ride into Florence shouldn't be too difficult. It is December 8 and a public holiday for the Feast of the Immaculate Conception. Cyclists are out in force. It dawns on us that we encounter them mainly in the flat areas and only on public holidays or at weekends; especially on Sunday. On this day, Italy is split in two: one half has donned the appropriate bike riding gear, racing along stretches of road, while the the other half are properly dressed and ready to go to church. Apart from feasting our eyes on the beautiful autumn colours as we wind down the road away from San Martino in Vignane, the only other interesting sight, that morning is the gigantic wall confining the medieval village of Lucca. The rest is pretty much a suburbia scenery. 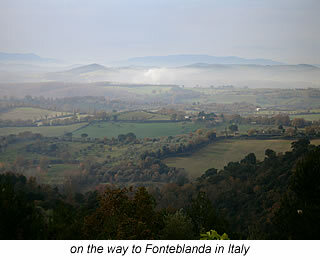 A picturesque landscape returns around the Arno river region and especially the section between Fucecchio and Empoli. We follow the waterway, unhindered until the irritating long waits in Lastra a Signa where roadworks allow no more than a one lane flow of traffic to maneuvering the narrow streets. It seems to us that the city of Florence begins well before its official start. We are on the S67 and enter the city on the south side of the river. At the first plaza-like split in the road, we see a sign to Piazza del Michelangelo. Winding our way up through gorgeous parkland and gardens, past grandiose villas and statues to one of the grandest monuments of all: Michelangelo's David. Even this copy is splendidly magnificent and I have been dying to see it since studying art hIstory in The Netherlands. 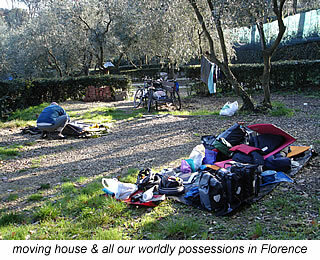 We arrive at the campground in Florence (91km; 379m) to find it completely full of camper vans. It is a long weekend after all, but there is still plenty of tent space available. I guess no-one is foolish enough to pitch one in zero degree temperatures except the Ozzie writing this, her Dutch husband and a single Spanish man on holiday in Italy. His tent had noticeably caught a bad case of mould at some stage in its life. It is €20 euros, which is normally pretty expensive - especially for a sloping gravel plot -but it is smack bang in the middle of a very famous city. We ponder over the pros and cons of the available space for a quite a while before making our choice. Unfortunately, our newly acquired plastic ground sheet draws in more of the night's rainfall than it should and we have a major mop up session first thing in the morning. A delicious cooked breakfast of spinach, almonds and percorni cheese wraps cooked in between the morning showers helps lighten the mood. The rain doesn't look like ceasing and in a dry spell, we venture into town anyway. Even though it is December, freezing cold and raining there are two hour long queues lining the entrance of the Uffizzi Gallery. I would hate to be here in peak times. We dart into the Duomo like everyone else, as much out of interest as necessity to shelter from the increasing drizzle. After a bit more walking around, dodging the pushy umbrella salesmen and finding an internet cafe, we decide to return to our very wet tent. It is difficult not being disheartened about the thought of preparing dinner in the rain. As we poke our heads out of the tent in the morning, the camper vans are leaving one by one. Over breakfast, we plan going back to the same sights again to view them in a different light. When we get back that afternoon, we are the only ones left in the campsite, bar a handful of die-hard travellers. Our tent still isn't dry and neither is our two day old washing. The next day we choose a sunnier position, do the usual bike maintenance stuff and try to find a shop for some bicycle parts. All attempts at the latter end up in a wild goose chase. From our ice covered tent, there's a stunningly clear view over Florence. We stumble into the cold very early to try and beat the queues at the Uffizzi Gallery. Being in Florence is like being in a virtual art history tour: The Medici Family, Vasari, Michelangelo, Brunellesci, Titian, Botticelli, Rafael, Filippo Lippi, Uccello, Da Vinci and the list just goes on and on. As I walk around and peruse masterpiece after masterpiece, the voice of Allard Koers - an art history lecturer - subconsciously resonates an explanation of why the neck on Madonna is so long or the significance of the dog on the bed next to Venus. The Renaissance paintings, especially Botticelli's, are all very much darker than what you see in the books and a little disappointing. I actually enjoy the endless sculpture work the most. While getting close to Figlio's work, I appreciate what Han Janselijn - our first year 3-D teacher - meant when he talked about the "soccle" being part of the artwork itself. Figlio certainly found that movement in the rock. As we make our way back to the campsite in the afternoon sunshine, we dodge the same umbrella salesmen as yesterday. They are still pushy but this time around they are selling copies of Renaissance paintings, handbags, belts and camera tripods. Adaptation at it's best. Though the roads are relatively bad, getting out of Florence is relatively easy. It does mean we have to pay attention cutting out the smoothest route. The countryside is breathtaking in every measure. Not only are there stunning views but we have to puff our way up some very steep climbs too. They are immediately followed by teeth chattering descends. We know a couple of passes are in store for us, but we see signage clearly stating that Sienna is only 40km away and if it continues like this, we'll make the only open campsite in the region in plenty of time. Every thing is going to plan until Poggibonsi. The roads get worse by the kilometer. Roads signs now indicate that Sienna is 46km away. I nearly have a major accident due to an unperceptive driver overtaking and directly cutting me off with a right hand turn. A bit further on and the turnoff to Costalpino escapes our notice and not one local seems familiar with these surroundings. One man lives 10 kilometres from the town we are asking for, but he is not able to direct us there. The only option left is to traipse through Sienna. We get a little lost and before we know it, darkness is looming. At 4.15pm, these days. I stop at a small delicatessen for some supplies and am greeted by a big burly bloke who really knows his food and wine. Every Italian delicacy is on display and I just order what looks good. He cheerfully packs everything into a plastic bag sporting a dapper and somewhat thinner photograph of himself, while giving me a lesson in Italian food items at the same time. While on the subject of food, I must say, if you want to forget all your troubles, then just walk into an Italian supermarket. Being a totally dedicated lover of this cuisine, it is always sheer delight perusing the untold varieties of pastas, cheeses and the top quality fruit and vegetables. Beware though, what is good usually costs money, but take it from me, each delicious morsel is worth every cent. Anyway, as I emerge from gourmet haven, Ali has the lights on the bikes and we trundle on up the hill into dusk. There's no appropriate spot to camp wild as suburbia continues on a long way. We stop at a service station and Ali decides it is probably a better idea to try and reach the nearest campground which is only about 12km away. I agree, though hesitant about riding this highway in pitch black. It is now 5 pm. The journey is every bit of a nightmare as you could expect. There is not a moment to lapse in concentration. I'm hopeless enough as it is in the dark, but having cars coming from the front blind you for a few seconds with their lights is really scary stuff. While the cars from the back may light your way, they come dangerously close since their is no shoulder. They make it quite obvious they don't appreciate us being on the road in the dark either. We make the turnoff and then a major climb starts. The campsite is only 4 kilometres away, but it seems like an eternity. Halfway there, and I surrender to walking the bike for a bit. I don't know how steep it is but it feels like 10%. My legs are like jelly and the bike is wobbling all over the road. I have very few pedals left in me anymore. Ali tries to pep talk me, but I can only scream through tears of fear and defeat: "I can't do anymore!" Even pushing the loaded bike is incredibly difficult. It is bitterly cold and I feel like a real loser. A few stretches appear a little flatter, so I try again. I last no longer than a few hundred metres. Later on that evening, I don't feel like such a dork when Ali relays that we had covered 102 kilometres and gone up 1585 metres of altitude with an average climb of 4%. At least there is a good reason for me feeling so completely zapped. We arrive at Le Soline campsite in Casciano de Murlo (102km; 1585m) to find a wonderful couple looking after the place. The set-up is fantastic. A huge smile appears on my face when I enter the home-style, heated bathroom. I revelled in even more delight at the hairdryer on the wall. The smiles turn to fits of laughter the next day, as the homestead donkey charges at a caravan leaving the parking lot and then later on bee-lines for Ali's parmesan cheese and honey sandwich. We relax in absolute peace, admiring the amazing views and simple pleasures from our tent opening. The day begins with an early morning upper-body workout by pushing the bike up a long 17% stone, mud lane way, followed by a few testing climbs of around the 15% gradient. Several tunnels with no shoulders were next to be crossed of the list of challenges and just when we think it is going to be plain sailing, we find out we are on a road that stops abruptly and have to cycle back the way we came. The day looks like it might have to end with a peak hour traffic cycle on a highway with no shoulder, but our luck changes and we stumble across a cycle path. It leads us to rows of campsites in Fonteblanda (106km; 773m) and one is thankfully open. Relieved, we set up camp for the night and while cooking dinner try and fathom out what the thrill is in a passenger hanging his head out of a car coming up behind a cyclist and then screaming in their ear. Really, what is that all about? It happened to Ali this time and it scared the living daylights out of him. I remember nearly falling off my bike the first time it happened to me in Portugal. Today, we have no idea where we will spend the night. 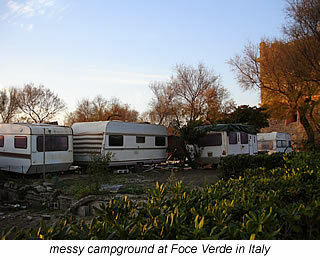 It is hit and miss with campgrounds in Italy out of season and it doesn't look like anything is open along the way. After a dull and boring highway stretch, we climb up into a beautiful village of stone houses overlooking the coast. There is a lot of fish farming to be seen in this area. We end up on a straight, flat road which Ali finds boring. The bird life of the WWF national park on the right keeps me entertained for much of the distance. I am less excited about the views of the rather ugly industrial port of Civitavecchia. We try the campground just before the town, but it is closed. Moving further along the coast, I duck into a shop in Santa Marinella, but by the time I get out, it is almost dark. No-one of authority that speaks English is around at the monastery, where we ask if we can camp the night. We can't wait around for an answer, so we carry on. I suggest turning a bit inland and the first left leads us to some suitable spots. Two farmers are out chatting on the side of the road and we ask if we can camp on the land behind them. They are more than obliging and though I can't understand all of what is said, I think they compete with one and other to see who's field we'll end up in. We pitch in Fausto's back field in Sta. Sevena (105km; 475m) and the next morning we leave with some of his wife's freshly baked rock-cakes and chocolate-almond biscotti in our hands. The flat start to the day is short lived and as soon as we turn off the Via Aurelia, the very steep bursts of climbing start and don't stop until we find the Via Aurelia again in Rome. The rubbish hits appalling heights around the town of Boccea where we witness a teenage kid sitting at a bus stop amid a sea of plastic and cans. I have never seen anything like this before in my life. The filth continues all the way into Rome. It is Sunday and the traffic is not as bad as we expected. Ali navigates us brilliantly along roadsthat look like they haven't been repaired since the Renaissance. We arrive early at the city campsite close to the heart of Rome (64km; 602m). It is amazingly cold and we spend most of the afternoon and evening inside the tent; only venturing out to cook or use the bathroom. It is getting a bit tiring not being able to do much in the evenings. None of these campgrounds have common areas where campers can sit and relax. And if they do, they are generally run-down or not heated, so I may as well find refuge in my Marmot feather-down sleeping bag. We tend to fall asleep quite early these days. We spend two days in Rome. One fixing the bikes, doing the washing and all the menial chores and the next one seeing the fabulous sites. They say Rome wasn't built in a day, but we aim to see most of it in that amount of time. We wander around the Piazza Venezia; the Roman Forum; the Colosseum; the Trevi Fountain; the Pantheon and the Vatican. Everything is big and flambouyant. Even the architecture of the average building is stunning. I could stop at each intersection to take in the atmosphere and admire the ornate structures, but that would then take a life-time. By the end of the day however, we both have had enough of the grandeur and riches. While it is special to be able to appreciate these treasures, it is not a true picture of Italy. The real Italy lies within the suburbs and unfortunately they paint a completely different picture. We use the Via Della Pisana to get out of Rome. Though still icy cold, the day is sunny and bright. We soon find ourselves in truck territory and the going is tough with no shoulder and extremely poor condition roads. Making a wrong turn and having to turn back doesn't help matters. An airport comes into view before entering Lido di Ostia and everyone is in a hurry resulting in a few road rage incidents. We stop at a playground to grab a bite to eat prior to hitting a string of coastal ghost towns, where the amount of dumped rubbish is offensive. Beach resorts run into one another making it one long strip of deserted apartment blocks that haven't received the long overdue paint job on the left and beach huts on the other side that are in not much better state. Very young and mostly dark skinned girls also line the forest and coastal roads of this region. Older men lurking around or waiting in their cars in the abandoned parking bays clearly indicates why these teenager girls are here. The next twenty kilometres feels intolerably creepy. We hit the town of Anzio, which is a little more spruced up, but it's not long before we are back on dismal roads running along side a military camp. I am jealous to see the generators pumping warm air into their tents. I am not, however, jealous to watch the silhouettes of gas masked persons with machine guns in hand playing fictitious war games behind the barbed wire. We cycle further. As we approach a faded camping sign, it dawns on me that the rubbish tip we have just passed is actually the campsite at Foce Verde (102km; 279m). The mess is not much different from what we have seen today, but it does look like they are in the middle of renovations. I hope for their sake they are. Anyway, it is just for one night and the shower, though not particularly clean, is piping hot. The next day Ali swaps a ten euro note to get his passport from the owner and we leave. Again there are plenty of cyclists on the road; again the terrain is flat. It is getting close to Christmas, so they are all probably on holiday. We pass another National Park, some pretty gorgeous beach fronts with plenty of closed campgrounds as we head in the direction of Gaeta. After a few tunnels we stop by the sea to eat lunch and decide that tonight we would like to camp somewhere near the sea. Marina di Minturno (99km; 400m) is disappointingly full of abandoned campsites, heavily padlocked and heavily guarded with nasty looking dogs. The rubbish lying everywhere just adds to the bad vibe, so we head back inland, following the Gargliano River in the dark. An appropriate place appears just next to a small farmhouse. Ali starts setting up, but I don't feel right about it without asking first. I get the opportunity, almost immediately, when a guy leaves the farmhouse and jumps in his car. He doesn't speak English, but after a bit of hand and foot language and my very limited Italian, he understands and motions he needs to check with his mother. A tiny grey haired lady comes out and judging by the big smile it's fine for us to camp in her field. We eat well and fall asleep, even though a wind storm is in full swing. The winds haven't subsided as we leave and there is a monster trip in store for us today. Subsequent to an initial 65 kilometres, we will then need to undertake cycling through the city of Naples before pedalling through to reach Pompei. Pushing against some pretty blustery weather, we have done 10 clicks when a two closely ranged signposts declare that Naples is both 46 kilometres and 53 kilometres down the road. Six kilometres on and the distance has become 47 kilometres. More than half an hours ride later and we are back to back to 50 kilometres. At least we know we are going in the right direction, otherwise it could be pretty confusing. Around Mondragone and the rubbish really becomes astounding. We travel further along the coast and it continues, we turn inland and it continues. By rubbish, I mean plastic bags of household refuse, cardboard, plastic bottles, cans, refrigerators, washing machines, mattresses, clothing and anything else I might have forgotten to mention. It is piled as high as possible and lining the road for anything up to 50 metres long. Probably the reason for the increased sighting of rats - both dead and alive - lately. Further a field, chemical bottles and plastic sacks from fertilisers and farming products are added to the piles. At some points we look at each other totally speechless. This is worse than we've have both ever seen before. It kind of makes me feel like a right proper idiot for carrying my six pieces of loo paper with me until I find a rubbish bin to pop it in. It would be nice if I could tell you that it gets better as wee head towards Naples, but it doesn't. What is worse ia the amount of stray dogs is multiplying rapidly. And they just love to hangout around the dumped rubbish. Leading up to and upon entering Naples, we forget quick smart about the rubbish as we have to concentrate so hard on navigating our way on vehicle-jammed streets of cobble-blocks - think cobble stones but much, much larger. Getting a tyre stuck between a gap is well on the cards here. Cycling with a load is hard enough, but you also have to watch out for people walking in front of you, scooters swerving close, cars thinking they are fast enough to pull out without warning. Riding a bicycle does have it's advantages though. In a traffic jam, with a bit of deductive planning, a quick eye and some hard pedalling, you can get there first. Key strategies in the attack are to: 1. develop a selfish attitude; 2. think about no-one else except yourself and focus on where you want to go; 3. push and shove, scream, shake your fist; 4. stick your bike in the middle of the road when you think that it is unsafe for them to overtake you; 5. be positively aggressive in your approach and 6. above all make a big noise about it, so you get noticed. Ali however, has a different one and thinks: "come on, just try and hit me". Personally, I try and avoid that particular situation but he has even got a landing position worked out: elbows pointed outwards and when you land on the bonnet, make sure they leave a big dent. He nearly gets his chance the following day while cycling in Scafati. An old fellow decides to turn right into a petrol station without indicating while Ali is just on his inside tail. He pounds his fist on the car to let the guy know he is there. It is so forceful, the poor old man slams on the brakes and is probably still suffering from shock as I write this. We make it after 1½ hours to the outer rim of Naples. This area, around Portici is supposedly dodgy, so we keep on pedalling through town. Apart from the steep inclines and cobbles which have almost inflicted serious damage to our bodies and bikes alike, we think the worst is over. But, just a little further on down the road, a dog decides my right leg is something to dig his teeth into and we lose a good half hour while I jump around and scream a bit louder than the seriousness of the wound deserves. As I clean the wound thoroughly with soap and water, an audience of local teenagers gathers around. Meanwhile, Ali tries to find the owner, but just as you would expect, the "it's not my problem" attitude emerges and ever so conveniently, the dog disappears for 20 minutes or so. Of course, such a beast cannot be locked up for too long and out he comes out in full barking-force following behind a rather slovenly dressed woman. Ali approaches her, but of course the dog isn't hers. According to her, it's a street dog. The story we get from the young kids in the neighbourhood goes a little differently. There is little we can do really, other than take a few photographs of where it happened and of the culprit, just in case I should start frothing at the mouth. We finally hit bitumen roads after the 20 kilometre long stint of cobbles. In comparison it feels like rubber. The roads are still pretty bad, but you can veer around potholes when the traffic allows. There's no beginning or end to the the string of townships that our map indicates. It is more like one long city that just keeps on going. So much so, I am totally oblivious to the fact that we have finally reached Pompei (100km; 540m). There are three campsites all within walking distance of one and other and the initial plan to check them all out is discarded when the receptionist at "Spartacus" is extremely helpful. We also ask her where a doctor is, so I can get my leg checked out and within seconds the owner is by our side. He rings a friend who handles these sorts of cases and we are directed to the nearest hospital. He also quite sweetly, apologises profusely for what has happened to me. He reiterates that it is a very big problem in Italy and much to my distress, in Pompei as well. A few days later the owner tells Ali that because Pompei is a pilgrim site, stray dogs often follow people walking here. It is a pity they don't follow them back as well. In any case, we feel we have chosen well. We set up camp for a few days strategically close to the toilet block and under three orange laden fruit trees. Because I am already inoculated with the rabies vaccine and all other dastardly diseases for that matter, we agree to go tomorrow morning to the hospital. Sitting inside, mostly because it's blowing a gale outside we both stare dumbfounded into space not uttering a word for about 30 minutes. Aaldrik finally breaks the silence with "I feel so sad. I can't face seeing or experiencing much more of this. I'm thinking that after we cycle the Amalfi Coast, we should get the train out of Salerno directly to Bari." I am of exactly the same opinion. Instantaneously, we both feel happier with our change of heart. It is December 23 and we have been married for 11 years. Spending the first part of the day in an Italian hospital, is not the normal way to celebrate things.It does make for a unique experience though since the emergency area is quite different to any I have seen before. Firstly, there is no queue or waiting room. Everyone is crowded around reception clutching bits of paper. No-one speaks English, but when we say "carne", they all know immediately what has happened and I am promptly ushered to a treatment room, much to the dismay of the other people waiting way longer than me. In order to get there, we have to squeeze past an old women looking very ill on a stretcher trolley blocking the entrance. In the room, there are two beds covered in protective tissue that has already been used several times prior to me. There are no chairs. The table in front is lined with plastic bins brimming with empty vaccine and medicine bottles; blood soaked cotton wool and used bandages. Second-hand syringes and needles lie loose in plastic bags lining cardboard boxes on the ground. I secretly think to myself that I might be better off not visiting this hospital. The medical assistant enters and wants to see the wound. The doctor then enters, ooh's and aah's a bit as he also looks at the bite marks. Ali gives him my vaccine booklet, which he ponders over for quite a number of minutes. He doesn't understand the rabies inoculation system at all, but is very impressed with all the other stamps and information. Ali and I both look at one another with raised eyebrows. I get the wound wiped down with betadine and a rather clumsy dressing is applied. According to this doctor, there is no rabies in Italy and my tetanus shots are up to date, so I need only to clean the wound for 7 days with Betadine Cream. Good advice I'd say. Both craving a pizza and being in the land where this fine cuisine originated, we decide to celebrate the day with going out to dinner. Unfortunately, we couldn't one decent pizzeria open and have to settle for the chain-like restaurant close to the campsite. Although it is quite nice to go out for the evening, I can assure you, what we were served was not a pizza. We leave with the craving still alive. We visit Pompei's excavation site the day before Christmas and while my expectations are completely different from what I saw, I am intrigued and positively charmed by all the colourful fresco work. On the down side, some scaffolding has been in place for almost as long as the place has been open and barriers are broken and weather worn which leads to questions about maintenance of the complex. Besides the spanking new restaurant built inside the ruins, I wonder where all the money goes to. If you come from outside the EU, even your children, no matter what age they are, need to pay the full 11 euros entrance fee. I can imagine some parents getting a little upset over that. Especially seeing as EU children under 18 are free. We rise early enough to stop off at the train station and purchase our tickets for the next day's journey to Bari. We expect that it will be quiet on the roads, however we are amazed at the volume of traffic and just how many shops are open. I suppose everyone has to by a panettoni to take to the relatives. Our round trip should be about 80 kilometres, but actually ends up to be closer to 100. It is worth every pedal, as this stretch of coastline is amazingly unique. In total, you are dropped an exhilarating 600m in one swoop and in a couple of sections, the spiral down neat rows of hairpins lasts for several kilometres. The views are more than spectacular and although the gradients are not that steep, I would suggest being reasonably fit before tackling the Amalfi coast. We curve in and out of villages lined with restaurants, hotels, ceramic factories and local shops. I contemplate the summer traffic jam these roads would habour and bless our timely winter visit to the region. It is perfectly serene. On the way back into Pompei (97km; 1406m), which we don't make until well after dark, another dogs tries to attack me making me realise that I will never be the same again and it will probably take some time before the fear of getting bitten again subsides. It is a four train hop today and we are wondering what the facilities will be like for our loaded bicycles. Basically, there are no real facilities for bikes and it depends entirely which train you get as to how much of struggle on and off it is. The first train to Salerno is relatively easy to get onto and there is a big spacious area to leave the bikes in. At this station, we wait a further 50 minutes after letting one train go by until a more modern form of transport arrives, which will be easier to access. We disembark again and wait for the Foggia Regional. Again it is a difficult task getting the laden bikes on, since I can't even normally step up into the luggage compartment comfortably. Our last train is the most inconvenient with and the bikes just have to go in the normal cabin space. The staff are more than 20 minutes late and the driver, anxiously waiting for his crew, ushers us towards a particular compartment, which is plainly not to the conductors liking. As he pushes my bike aside in disgust, it topples over. He looks quite drunk or wasted on something and rudely grabs our tickets. A superior sends him running to the other end of the train, but he is back about 15 minutes later, still glassy-eyed. He begins to hassle us about tickets for the bikes. Luckily, we have checked this all out before and know for certain that bikes travel for free on regional trains. He threatens to throw us off. We just argue back and eventually he leaves when he realises we won't give in. He doesn't harass us anymore, except to make out that it is very difficult to maneuver around our bikes, every time he needs to pass. Well, I guess when you are off your face, it is hard to maneuver around anything. We arrive in Bari, pretty much on time and after only asking twice, we make it relatively easily to the ferry terminal. The tickets with Superfast Ferries are the price they say they are on internet and we opt for the extra €12 airplane seat. It is money badly spent since the area is stifling hot. We leave after an hour to find a more comfortable seat on deck to sleep in. After the 15 hour ferry ride, we make our way straight to the cheapest pension in town for a couple of days rest before venturing our way through the Peloponnese. Nicos Pension, by the way is really clean. A neat double with share bathroom cost us €30 - refreshments included and I can certainly vouch for the delicious El Greco coffee. I drunk enough of it. Immediately, we are made to feel very much at home here and are overwhelmed at the politeness and friendliness of everyone. Good sign of things to come for the new year I guess. Patra is a modern, buzzing town with everything available that you can possibly think of. Ali does most of the walking around and purchasing of whatever is needed, while I sit in our small, but incredibly quaint room to type and edit films. The most disappointing news is that my video camera cannot be fixed. The lens cover has worked its way loose. Three tiny screws holding this and the focus ring in place, have come away and they are unfortunately fixed in place from inside the closed unit. The man at the Sony shop, shook his head and said he regretfully has to deem the camera useless. We are having nothing of that and Ali's steady hand superglues the whole thing back together. It seems to be holding up so far. This will be our last entry before New Year, so to all our friends and family: please make sure it is a very merry one! Personally, I could stay another few days under the comfort of Nicos Pension's roof. Everything is so easy here. One perfect example is going to the toilet in the middle of the night. When camping, it can be a pain-staking ordeal. First, you wake up and then fall asleep - at least a couple times - until the bladder decides "No more!" Then, you have to unzip the snuggly-warm sleeping bag and allow cold air to engulf you; you put on enough clothes suitable for 3° C temperatures; you have to unzip the inner tent; climb over Ali's head to the outer tent; zip the inner tent back up if you decide you want to be nice to Ali; put your feet in your shoes lined up ready for this exact occasion; unzip one side of outer tent and acrobatically slide out into the night. As soon as you have walked to wherever the toilet is - not forgetting in your sleep-dazed state to take the toilet paper with you - you then have to decide whether you should wake-up fully by sticking your bottom on the icy cold surface. I'll pause a moment on this point. Why do so many (European) campsites refuse to put toilet seats on their toilets? Is it written somewhere that all campers have backsides made of steel and are therefore resilient to the cold? Whatever you decide, you will still need to stumble back to the tent; do the unzip and zip-up routine once again, but in reverse order; remember to take your shoes off before crawling back over Ali's head and into the inner tent; remove the unwanted clothing; jump in the sleeping bag; adjust the pillow and finally settle back to sleep. Aaah Haaaah! After 3 nights of comfort and not before the hygiene-conscious owner has placed her bucket of disinfectants on the table in our room, we leave Patra. We head to Ionian beach, which is on the top tip of the West Peloponnese coastline and here we find a campsite in Glyfa (85km; 292m) next to the sea. It is sadly barricaded off with a wire fence, leaving us still searching for the illusive campsite on the beach. 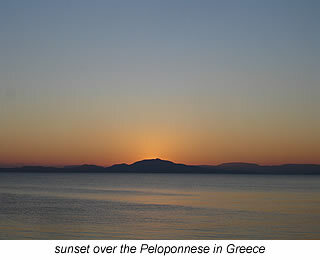 The ride is quite unspectacular and it seems throwing rubbish from the car has become a popular sport in Greece as well. The countryside is rural; very rural. A radiant red sunset promises another stunning day tomorrow. Owners and guests alike invite us to stay for the New Year's Eve celebrations they have organised and although we are quite tempted - what with everyone being super friendly here - we both decide to continue on tomorrow. Something sounds special about seeing the New Year in while camping near Mount Olympia. Nothing could have been further from the truth. Clear blue skies and toasty warm sunrays make it feel like Spring. Judging by the amount of sour-sops, borage, jonquils, wild irises and orchids around the place, it could be. But the icy-cold night temperatures and early morning frosts let us know that it is still well and truly Winter. Olympia (62km; 422m) is a tourist town; nothing more, nothing less and at this time of year it has a lost and forgotten feel about it. I wonder how the souvenir shops - all selling the same fake ancient-patterned pottery, ceramic copy statues and jewellery - all survive. "Camping Diana" appears well and truly shut when we arrive at around 3pm and after a long line of swear words, Ali tries the gate. The padlock is not bolted, so he goes up to the house inside and rings the bell. An old man opens a door and we are pointed in the direction of a camping area completely covered in leaves which hasn't seen the sunlight since probably about August. Ali puts up the tent while I quickly stroll around the town to see what is happening here tonight. It is completely dead. The Tourist Information is only open from 8am till 10am, most shops are shut and the only bar open in the village intends to close around 11pm. I head back to our recently assembled home and over a beer, we change our original plan of spending two nights here. Even if we had decided otherwise, the icy cold shower would have made my mind up for sure. Luckily vegetable curry and rice is on the menu tonight: something to warm the body and spirit up. We still need a little help from our sleeping bags too as we try desperately to stay awake until midnight. The town is completely deserted and the only noise comes from howling dogs and passing traffic. We don't stay awake, as you can imagine. At 11.15pm I get up and do the dishes and then wake Ali ten minutes before the big event. At twelve midnight, two fireworks go off, but before we have made it out of the tent they are finished. A far cry from the displays we are used to witnessing every year in the Netherlands. Also out of custom for us, we see January 2007 in with a hot cup of coffee and a swig of grappa.